Eggless Fresh Strawberry Cake with cream cheese frosting because you do not need a reason to make treats with Strawberries. This cake is a Strawberry Lover’s dream . With soft tender and moist crumb this cake is layered with it’s best friend “Chocolate” and additionally with irresistible Strawberry cream cheese frosting making every bite a delish experience. It is VEGAN and BUTTER FREE. But all this was not in the plan. I was cleaning up strawberries and my son entered the kitchen .With a big smile on his face and sparkle in his eyes he said “ Mamma can you make a strawberry cake for me please .. please please please!!! Well how could I say a no. I told him give me sometime and the cake will be ready before your dinner. I love fresh fruits in my cake but sometimes they tend to ruin the Ph balance and taste funny. Luckily this experiment was a sweet success and hence I am all excited to share it with you. This recipe is adapted from my eggless vanilla cake recipe which is incredibly moist and has never failed me. It all started with gathering and measuring the ingredients. I then sprinkled some sugar on the strawberries so that it releases it’s juice and then after 30 minutes I pureed it. I decided to make it like a sheet cake because the plan was not to frost it. Just enjoy it out of the oven . But my son had different plans altogether. Hmmm why not!! I wondered as Strawberry and Chocolate are like match made in heaven . While pulling out cream from the fridge to prepare the ganache I saw a packet of cream cheese which was soon gonna be expired. I thought why not whip up a quick strawberry cream cheese frosting too as the entire combination will taste killer. We enjoyed half of the plain strawberry cake sponge that night and shared some with our neighbors . As the cake has no extra artificial strawberry flavoring/ essence or pudding mix the cake had a subtle but a refreshing and lovely strawberry taste. So I thought topping it with strawberry cream cheese frosting is a good idea. This would be like an added bonus for us “ strawberry lovers” . After dinner and clean up I prepared both the frostings. Kept the ganache at room temperature to set and cream cheese frosting in the fridge. The next morning I again prepared one more batch of this delicious fresh strawberry cake. I like how this cake is fuss free and comes together with ingredients found at home without any special trip to the grocery store. Make sure you have loads of strawberries 🙂 I let the cake cool down completely. Then wrapped the cake in cling wrap and foil and placed it in the fridge for 3-4 hours for easy handling while frosting. After picking up my son from school we ( my sous chef – my son) quickly frosted the cake . We did not fill this cake with frosting. Only topped it and served as sheet cake squares.Topped it with more strawberries and a drizzle of chocolate ganache. You may fill and frost the entire cake with frosting if desired. My son helping me frost the cake. It’s a great after school activity 🙂 Don’t judge us for having so much cake . Make it yourself and you will realize what you were missing in life. It makes a lovely bake for any occasion . Valentine’s is around the corner so you know what you have to bake next. I even have a lovely tip for you. If you are baking in a sheet pan or a larger surface pan like the one below , after adding the batter to the pan consider adding a rose pin in the center . This will ensure uniform heat distribution and your cake will bake with a flat top and evenly . A vegan fresh strawberry cake with moist tender crumb and 2 delicious layers of frosting. 400 grams Fresh Strawberries washed then hulled and sliced . 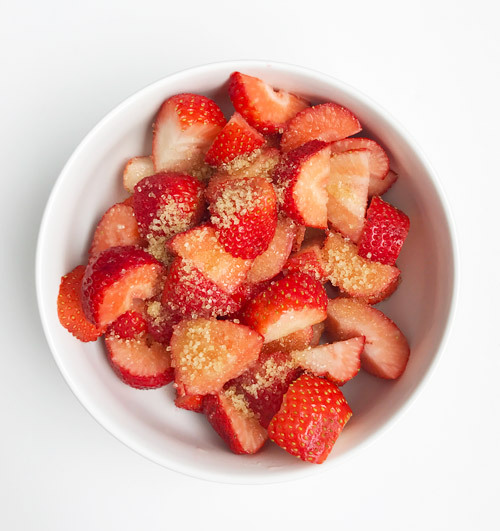 Sprinkle sugar on the sliced Strawberries, cover and let it sit for 30 minutes to an hour. Preheat the oven at 180 deg C/ 350 deg F.
Prepare the pan by lightly greasing with oil and then sprinkling some flour on the base and sides. Cut a parchment paper tracing the base of the pan and place it in the pan. Sift and measure dry ingredients in a bowl. Measure and place wet ingredients in another bowl. Now add the wet ingredients to the dry ones slowly. Use a whip/ balloon attachment to whip the batter. Whip until mixed without lumps, do not over mix. Pour the batter into the pan and tap the pan gently on the counter to let the air bubbles escape if any. Place a rose pin in the center of the pan if available. Refer to the tips mentioned above in the post. Bake on the middle rack for 35-40 minutes or until the toothpick inserted comes clean or with few tender crumbs and not liquid batter. After 15 minutes, loosen the sides of the pan with a butter knife. Invert the cake carefully and cool it completely on a wired rack. If decorating then cover the cake with cling and foil wrap , place it in the fridge for 3-4 hours or overnight for easy handling while frosting. All ingredients need to be at room temperature. I have used 10” square pan . This recipe makes one 9 “ cake / 10 “ cake or 9*13 cake, Bundt cake. For one 8” cake or two 6 “cakes simply cut the recipe in half – baking time will vary accordingly. If sugar granules are big then pulse it in a blender after measuring so that it melts quickly in the batter. Substitute corn flour with equal amount of All purpose flour. The consistency of batter needs to be thick so I don’t feel the need for extra liquid. Use a teaspoon liquid at a time if batter feels difficult to whip. Substitute lemon juice with vinegar . For detailed Chocolate Ganache recipe – click here . 150 ml / 1 tablespoon less than 3/4 cup approx full fat coconut milk. 175 grams/ 1 cup approx vegan chocolate – dairy free. Notes- If you aren’t vegan then you may sub coconut milk with heavy cream and vegan chocolate with semi sweet baking chocolate or choco chips. For detailed cream cheese frosting recipe – Click here . Note- If you are not vegan then feel free to use regular full fat cream cheese , confectionery sugar, butter and jam of your choice . If you are an ardent strawberry lover and do not want anything overpowering it’s taste then I recommend you to skip the ganache as chocolate is a bit overpowering here. Saying that , adding chocolate cuts on the sweetness of the top cream cheese frosting. Overall I felt it was a lovely combination of flavors mingling seamlessly. But feel free to add or skip the frosting. Hope you like this recipe and do give it a try. I would love to hear from you. Do leave me your valuable comments and suggestions below . You can even leave me a message on my Facebook page Carveyourcraving. Did you know that Pinterest has an exciting new feature . The “Tried it” button that lets you check off recipes that you have tried and leave your reviews. You can leave a special note or add your valuable tip for other readers as well. All you have to do is log into your Pinterest account . You will find a check mark on the top of every recipe or project that you have pinned . Check the ones you are done with and leave a review if desired ? Never miss a recipe . If you like being here do subscribe to my blog. Pineapple doesn’t behave the same way. You will have to play around with baking powder or soda . If making strawberry cake it is sturdy enough under fondant for sure. Do you think if I replace the strawberry puree with canned pineapple puree, the results would be same? Or is there anything else other than sugar I will have to take care of? I am planning to make this cake, frost it and then cover it with fondant. Will that work fine? Ok Radhika just add some more liquid like water or milk 2 tablespoon at a time if the batter is too thick. It depends on flour quality or strawberry puree used too. Just add more liquid next time. I tried the recipe and it tastes great .. but my cake has turned out a little dense.. the batter was super thick as compared to any other cakes that I bake .. any suggestions? Glad to know that Smitha! Yes. Homemade yogurt is fine too . Thank you, one more doubt. The yogurt used is of thick consistency? Like the ones we get from shops? Yes it will stay moist and fresh Smitha! This is the strawberry cake I baked using your recipe ! Cannot thank you enough. It turned out perfect. I have never had such amazing results baking an eggless cake. I actually used the cake 2 days after baking, the cake actually remained moist and soft. Thank you so much ! Hi, I am planning to bake this for a birthday party. The party is on Friday. So if I make it on Wednesday, frost it on Thursday, Will it stay fresh on Friday? Latchumi, I test my recipes many times before posting so that my readers have 100% success. Please follow the recipe to the T for it to succeed.Changing proportions might affect the outcome. Thank you for your query . Please try again. 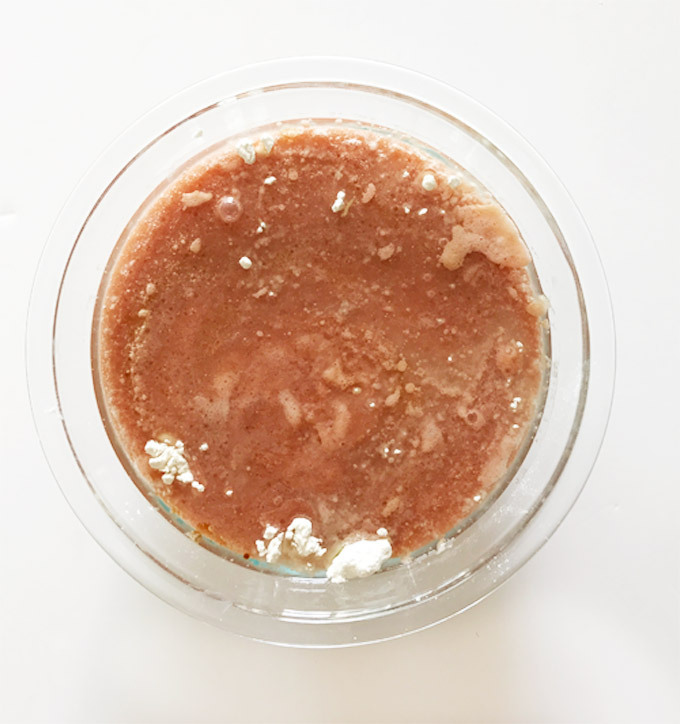 Hi… I tried this recipe with 1/4 cup puree and 3/4 cup curd.. It’s little dense and sticking…. Does the change in puree and curd affect the texture..
Hey Archana you could do 60% whole wheat and 40 % apf or oats flour too. I have healthier strawberry muffins on my blog too if you are interested. Hi, if want to use WWF how much quantity can be used to replace apf? Heloo Hema , simply substitute the yogurt with non dairy yogurt like soy or coconut one and add 2 teaspoon of vinegar to it. Hi Khusboo, it looks so yummy. Can you let me know what variation to use to make vegan vanilla cake? I saw your vanilla cupcake recipe. Can you let me know how to make it vegan? Thanks in advance. Wow so happy that you tried it again. What happened with the frosting ? I would love to see it. khusboo, i tried the cake again over the weekend, turned out awesome. . my frosting wasn’t as pretty as yours, but i guess that waill still take some time. But irresistable ! glad i tried it again. Happy to know that it worked despite of all the changes you ave made. You have a good eye when it comes to baking and altering recipes. That is absolutely lovely. Can’t wait to see the cake. Hugs!! I made this yesterday, increasing the quantity by 1.5 times as I wanted to make a 2 kg cake. The cake has come out very soft. I baked in a single 10 inch pan and was worried that it may not get cooked evenly. But the cake has come out unbelievably soft and got baked evenly and nice flat top. The store bought filling was not very sweeet, however, I reduced the sugar just by a fractions fm it has come out well. Thank you for sharing the recipe. I haven’t frosted the cake yet. Will be doing it today and will share pictures with you on FB. Yes Nasima, the puree goes with the wet ingredients. Store bought filling will be sweetened right? If yes then the sugar measures will change. Hi Khushboo, thank you for sharing this recipe. I went through the recipe a few times, but couldn’t figure out where you have used the strawberry puree. You have mentioned to puree the strawberry and then mixing wet and dry ingredients. I am presuming that the puree goes with the wet ingredients, however, it has not been included under wet ingredients. Also, in place of fresh strawberry, I am intending to use the store bought strawberry filling, then the proportions would remain the same? Do I need to make any changes at all? Thank you for always patiently responding to all queries. Sure you can use greek yogurt. I don’t strain the puree as I like the seeds texture. You may strain if you prefer. Hey khushboo.. your recipes are very good..I usually make mango cake with lots of chopped almonds. I have just one question regarding this recipe.. I didn’t get the strawberry puree part .. when to mix and how many cups ? Fantastic Kavita, I am happy you and your family loved it. Turned out amazing . Thank you. I was looking for an eggless fresh strawberry cake for a long time and this was the best . My family loved it . Hey Sneha, Strawberry buttercream sounds great. For every cu of butter cream add in 1/2 tablespoon of strawberry jam/ spread. Beat it to incorporate well. And click loads of pictures 🙂 good luck. Hi Khusboo, can wait to try this recipe. Strawberries are our favourite. Just wanted to ask one thing. Cream cheese is not easily available here so am planning to use strawberry buttercream. 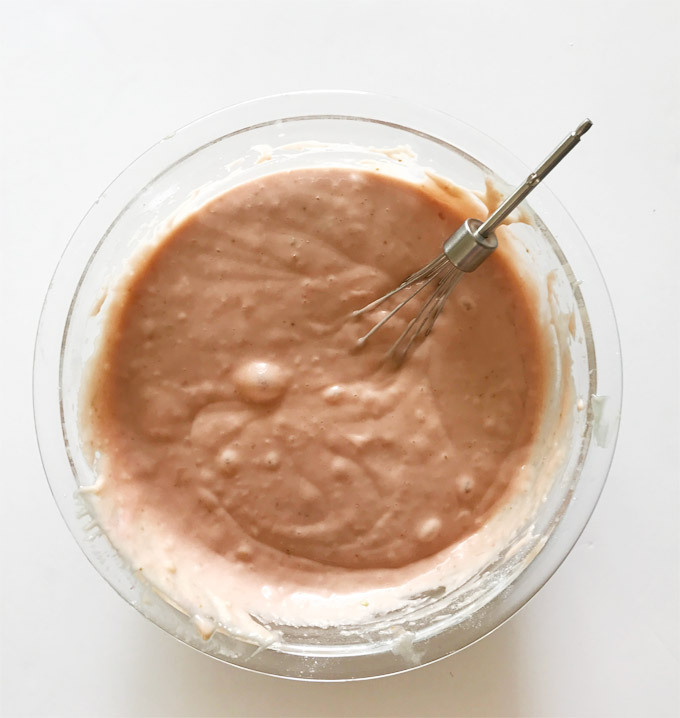 I have already made simple buttercream using your recipe. Can you guide me as how to make strawberry buttercream?